It goes without saying that the immigration process and our security measures to curtail illegal immigration are a mess. We have heard many different ideas submitted to the public forum, and many fall because they cannot garner the support of the people. This is large part due to the fact that no one is addressing some of the very real issues: security. I would like to tell you something that I would like to do, once elected to the US House of Representatives, and that is comprehensive immigration reform. Now before anyone jumps all over the terminology I am using, this is not what has been proposed by the “Gang of 8.” When I use the word comprehensive, I am referring to an approach that encompasses the many facets of the immigration and security debate. So here is my basic proposal for security and immigration to the United States. 1. It should be noted that border security is paramount before anything else can be done. We faced the same debate in 1986 during the Reagen administration, where amnesty was granted to approximately 2 million illegals in the United States, but in spite of the promises, no security was given to our porous borders, and as a result we now face anywhere between 11 and 33 million illegal immigrants in our country, with thousands more crossing each month. So how do we address this issue? First, we must finish building the fence that was put into law in 2006, but has not been enforced. Second, we must increase the funding to the Border Patrol so that they can get the man power and technology they need to enforce our border laws. Third, we must hold the president and his officers accountable when they choose to selectively enforce the law. There must be sanctions on them if they refuse to dutifully execute the laws passed by Congress and signed into law. I would call on the ground teams, men and women who patrol the border, to ask them what they feel would help them do their jobs. They are the eyes and ears of our security, and they must be brought into the equation. For far too long we have allowed for academia to push through theories, instead of having the people with the practical application to do what is necessary. Finally, we must not interfere with states that pass laws to strengthen our border laws and security. When our federal government sued the state of Arizona for the enforcement of federal law through their own state statutes, I was appalled. The state of Arizona saw an issue they deal with on a daily basis, and their law enforcement has the experience to be able to deal with the issue. The federal government should not interfere in such matters, and should have supported Arizona. 2. Many will sit and talk about the Southern Border, but do not seem to mention our neighbor to the North. We cannot have a secure nation unless all borders are secure. There is a very real threat from not having a good plan and enforcement in place. We cannot forget that the same measures mentioned with the South, must also apply to the North. 3. Only about 60% of the problem even comes from immigrants coming across either of the borders. 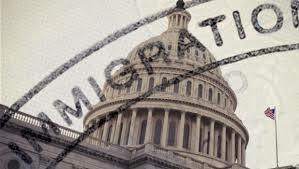 We have found, working with people in the law enforcement community, that nearly half of the problem comes in the form of people either over staying their visas, or never showing up where they were supposed to be according to their entrance paperwork. In 2012 alone, we found that there were over 15,000 persons who came to the country legally, never went to their intended destinations and nearly 1 million never checked out of the country (overstayed their visa). Now, I do not know the answer to this problem, but something must be done. Again, I would be meeting with the customs enforcement to come up with viable solutions to get them the manpower and help they need to ensure that this does not continue. We can’t be losing track of this many people. 4. Now, my personal belief on the immigration process is that you must go to the end of the line. If a person is willing to go to the back of the lline, I see no need to deport them and separate them from their families. However, if they aren’t willing to apply for US Citizenship, and wait their turn, they must be deported for breaking the law. We cannot reward those who break the law. 5. I also would like to propose that any crime committed on US soil by a person not of legal status, that they be immediately deported and barred from entry into the United States. Our prisons, especially in the border states, are full of criminals who entered the U.S. illegally. We are paying approximately $30,000 per year for each of them. If it is not a federal facility, the states are footing the bill. Either way, the American people are paying for their three meals a day, housing, etc. while they stay in prison. We need to immediately deport them. 6. I believe that if someone is willing to join the United States Military, they should be automatically sworn in as a U.S. Citizen after two years of peace time service, and immediately if they will serve in a conflict area. There should be no long waits for such people. They believe so much in the American dream, they sign up to defend the Constitution. That is good enough for me. I fully understand the want to come to America and try to get that little piece of liberty. We must ensure that the process is fair for the people trying to live their own dreams as many of us have had the ability to, but it must be within the respect of the law. Part of our law is that in order to have that piece of the dream, one must apply to become a citizen and renounce all foreign allegiances. You must want to be an American, or at least in the case of the migrant worker program, you must be willing to work hard in order to be here. There is already a path way to becoming an American citizen. And while it may be a little burdensome, we cannot blanket an amnesty program and think that will work. I would actually like to hear solutions from those who have been through the immigration process and have become U.S, citizens on their thoughts. They lived the transformation, but I hear no one in Congress asking them what they feel should be done to help reform the system. I say, let’s talk to them. Together we can improve the process, but we will not stand for amnesty, and we will not stand for a country that cannot secure its borders and its interior.